There is no denying that cold weather is here to stay, at least for a while. Living in the Midwest, that is no surprise, of course. With the hustle and bustle of the holidays it is easy to forget things like preventative home maintenance, but unless you want unnecessary home repair bills, you really should make sure your house is truly ready for the bitter cold days of winter. If water freezes inside a pipe, it can expand and cause the pipe to burst. Water should be drained from outside faucets and hoses should be disconnected. Pipes that run through unheated areas of the home, such as an attic or basement, can be covered with insulation to protect them. Clogged gutters are the most common cause of ice dams, which is a buildups of ice along the edge of a roof that prevents melting snow from draining off the roof. The blocked snow can then refreeze and form icicles, which can tear off gutters, damage shingles or cause water backups in your house. Cleaning out the gutters can help keep the water flowing during the winter months. 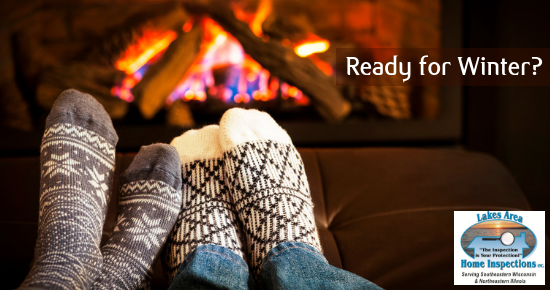 Before the weather gets too cold, make sure the heat is in good working order. Dirty furnace filters can affect the heat, so start the season with a clean one. You might want to invest in a programmable thermostat as well, to ensure comfortable temperatures all winter long. Caulking around windows or installing weather stripping around doors can help seal up gaps and can go a long way in keeping the cold air out of the house. Simple fireplace upkeep like keeping the flue closed or installing glass doors on the front of the fireplace can also help keep the warm air inside. You want your home to be comfortable and safe, and so do we. At Lakes Area Home Inspections, we always keep this in mind when completing our inspections. We pay attention to the details that can make an impact on your living environment and safety and provide detailed reports of our findings. Call us at 262-818-0911 to see how we can make a difference.